Everything that you need to know about writing and naming ionic formulas; from the simple binary ionic formulas, to the more complex formulas involving metals of variable charges from the transition metals block. Scroll down the page to see all three videos and the extended explanations and practice problems. How to name basic binary ionic formulas; formulas that involve only two elements; a cation and an anion. In addition, I introduce the cross-over rule which is handy for situations when it is difficult to determine the right ratio of cations to anions in a formula. Moving on from the basics of binary ionic formulas; it is common to encounter ionic compounds whose ions are composed of more than one atom; polyatomic ions. 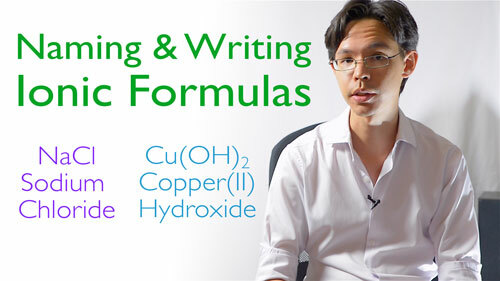 In this video I explain how these are written differently in formula when multiple polyatomic ions are needed, and also how to recognise them. For more information on polyatomic ions; click here to see my other page about them and an interactive activity that you can play with to help memorise them. How to write the names of ionic formulas that contain elements of variable charge (the transition metals, and other metals). 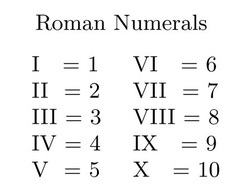 Also, how to write the formulas from these names. What are the transition metals and other metals? The transition metals reside in the middle of the periodic table; kind of in the 'sunken' park of it, and the other metals are to the right of this, residing just underneath the staircase divider between the metals and non-metals (see Figure 1). These metals have a chemical property that their electron configurations are more complex than the rest of the elements and so can have a number of possible oxidation states (1+, 2+, 3+, etc, charge). This introduces some complexity to writing the names of ionic compounds that contain them. For example, when you write; Iron Oxide, do you mean Fe²⁺, or Fe³⁺? Determine the ionic charge of the non-metal, as these will be easily identified from their location on the periodic table (see Figure 1). For example; CuO, the copper is a transition metal, so its oxidation state can be anything, however oxygen in this ionic compound is the ion oxide, which has a 2- charge due to its placement on the periodic table (see figure 1, also click here to see my other video on ions for more info). Since there is only one oxide ion present, we won't need to multiply as per step 3, but we can deduce that since there are 2- charges, there must also be 2+ charges which can only be from the single copper ion present. Therefore, Copper is 2+ charge, and is written as Copper(II) Oxide.